Unlike some BXP-based diskless kernels, or Linux kernel + application configurations, Youngzsoft diskless system, CCBoot, was made from lines of codes from the bottom. Regardless of the service kernels or functional applications, they can be corrected and improved at any time, which also means that we can modify and respond timely according to users’ needs and experiences. CCBoot was not developed from the PXE old diskless transfer mode, it was based on the latest diskless transfer mode, that is, gPXE + iSCSI protocol. No matter the design concept or protocol architecture, CCBoot is leading the peers. You can find our software copyright below (Figure 1-1). This certificate proves the copyright of Youngzsoft diskless system software, CCBoot for short. 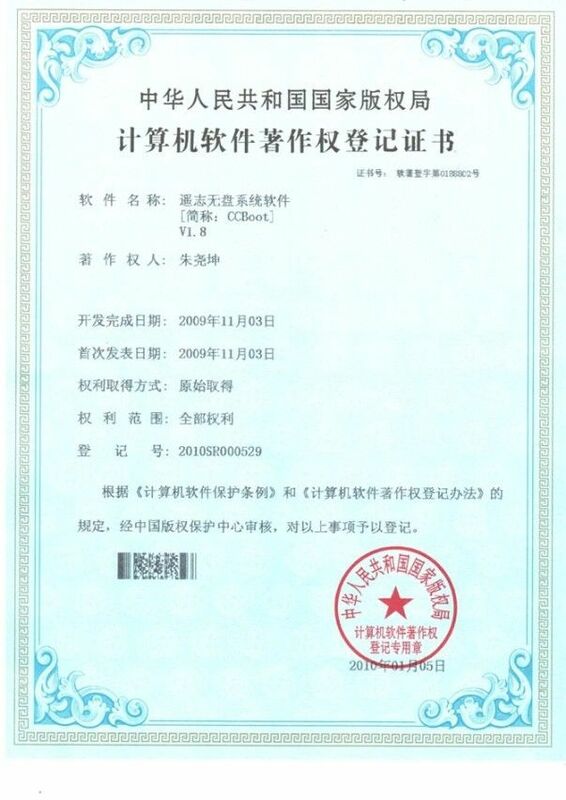 According to the “Computer Software Protection Regulation” and “Registration of Computer Software C”, CCBoot copyright is protected and certificated by National Copyright Administration of the People's Republic of China in Jan. 5th, 2010.